Please request publications that aren’t available here via my ResearchGate profile. Zamani A, SC Crews. 2019. 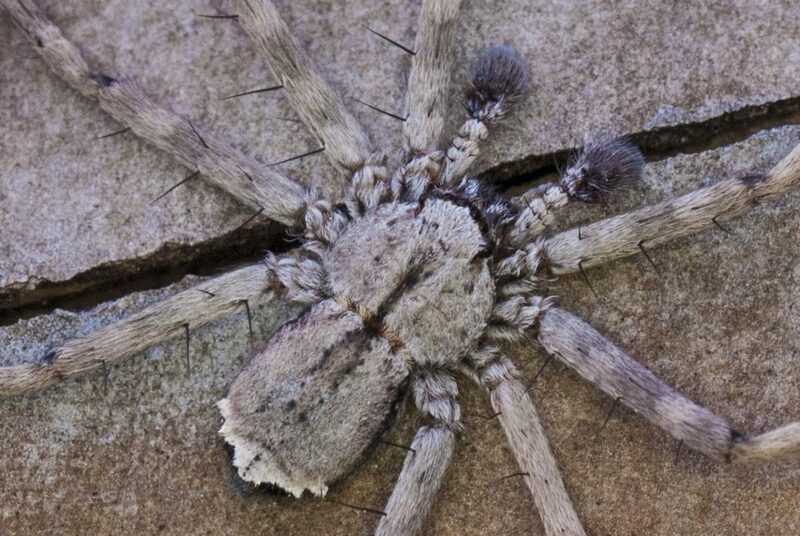 The flattie spider family Selenopidae (Araneae) in the Middle East. Zoology in the Middle East DOI: 10.1080/09397140.2018.1540150. Maddison D, K Will, SC Crews, J LaBonte. 2018. Bembidion ambiguum (Coleoptera: Carabidae) is established in California. Biodiversity Data Journal 6: e30763. https://doi.org/10.3897/BDJ.6.e30763. Crews SC. 2018. Two new species of flattie spiders (Araneae: Selenopidae) and descriptions of undescribed males from the Caribbean. Zootaxa 4446(1): 125-137. https://doi.org/10.11646/zootaxa.4446.1.9. Crews SC, AK Thomas, S Hester. 2018. First Record of Selenops submaculosus Bryant (Araneae, Selenopidae; a flattie spider) from Louisiana. Southeastern Naturalist 17(1): N10-N14. VanderSal-Jensen ND, SC Crews, RG Gillespie. 2016. Is love in the air or at first sight? Mate finding cues used by sympatric male velvet ants (Hymenoptera: Mutilldiae). Invertebrate Biology 135: 1-11. DOI: 10.1111/ivb.12128. Crews SC. 2013. Thirteen new species of the spider genus Karaops (Araneae: Selnopidae) from Western Australia. Zootaxa 3647: 443-469. Crews SC, LE Stevens. 2009. Spiders of Ash Meadows National Wildlife Refuge, Nevada. The Southwestern Naturalist 54: 331-340. Crews SC, E Wienskoski, RG Gillespie. 2008. Life history of the spider Selenops occultus Mello-Leitão (Araneae, Selenopidae) from Brazil with notes on the natural history of the genus. Journal of Natural History 42: 2747-2761. Crews SC, MC Hedin. 2006. Studies of morphological and molecular phylogenetic divergence in spiders (Araneae: Homalonychus) from the American Southwest, including divergence along the Baja California Peninsula. Molecular Phylogenetics and Evolution 38: 470-487. Crews SC. 2017. Selenopidae in The Spider Genera of North America, 2nd Ed. D Ubick, P Paquin, PE Cushing, V Roth, eds. Pp 241-242. American Arachnological Society. Crews SC. 2017. Homalonychidae in The Spider Genera of North America, 2nd Ed. D Ubick, P Paquin, PE Cushing, V Roth, eds. Pp 130-131. American Arachnological Society. Crews SC. 2005. Selenopidae in The Spider Genera of North America, 1st Ed. D Ubick, P Paquin, PE Cushing, V Roth, eds. Pp 241-242. American Arachnological Society. Crews SC. 2005. Homalonychidae in The Spider Genera of North America, 1st Ed. D Ubick, P Paquin, PE Cushing, V Roth, eds. Pp 130-131. American Arachnological Society. Smithsonian Magazine “Meet the Spider With One of the Fastest Spins on the Planet” J. Treviño, 15 February 2018. Australia’s Science Channel “Spiders win gold in fastest spin competition” C. Harigan, 13 February 2018. Daily Mail UK “Blink and you’ll miss it: Incredible footage shows how flattie spiders turn to capture their prey in a record one eighth of a second” C. Borkhataria, 12 February 2018. National Geographic “How One of the Fastest Spinning Animals Catches Its Prey” E. Zachos, 12 February 2018.
http://www.inaturalist.org “Observation of the Week, 7/7/17” T. Iwane, 7 July 2017. WA Today “US scientist lured to WA by spider deemed ‘world’s fastest predator‘” E. Young, 23 June 2016. Daily Mail UK “Terrifyingly quick: Australian spider could be the world’s fastest lunging predator” A. Bohle and N. Groom, 20 July 2016. ABC News “Could an Australian spider be the world’s fastest lunging predator?” E. Parke, 19 June 2016. UWI Mona Now “New species named after UWI professor: Selenops wilsoni found in the Hellshire Hills” C. Brenton, 1 Sep 2013, v.3, n.5. St. Maarten Daily Herald “New ‘flat’ spider found on island” A. Singh, 21 February 2007. Times of the Islands “Arachno-filia” B. Riggs, Winter 2007.